Losing your Mobile Phone can be as scary and stressful as losing your wallet, especially if you store passwords, financial data, and other sensitive material on you handset. So here today we Provide you to Apps which will help you to Recover and Find your lost Android Mobile Phone easily. All these 2 apps are free and Helpful to all Android Mobile Users. Ever lost your phone and you go to call it to listen for the ringer and remember its on silent mode? 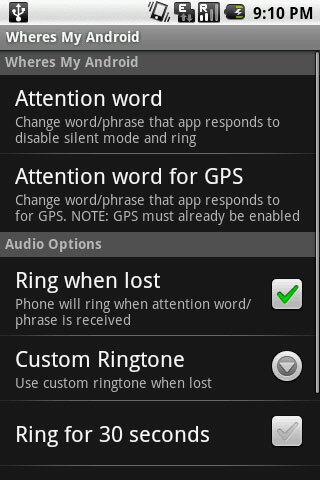 Now when you lost it you can text your phone and it will turn silent mode off, the ringer volume up, and start ringing. Where’s My Android is awesome! It helps you find your phone when the ringer is turned all the way down or on vibrate. Mobile Defense, put simply, helps you protect your Android phone in case it’s lost or stolen. The app runs quietly in the background of your device, using a negligible amount of memory and battery power (in fact, its creator says the program employs practically no resources unless you’re actively using it). When you install the app, you set up a secure account that allows you to log on from the Mobile Defense Web site. Then, anytime you can’t find your phone, you simply sign in, click “Connect to Phone,” and you’re locked into your Android device. Mobile Defense will pinpoint your phone’s location down to an exact address, even displaying it for you on an embedded interactive map. Within the same dashboard, you can remotely lock or unlock your phone and sound a loud “scream” (think obnoxious car alarm noise) through your phone’s speaker. It is quite help full information. Good Work Kiran. Keep post the things..